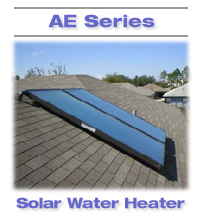 AE-Series "Flat Panel" Solar Thermal Collectors, manufactured in The United States by Alternate Energy Technologies (AET), are designed to meet the needs of any solar system including solar hot water, space heating, radiant floor heating or industrial process heat. AET is dedicated to building the AE-Series Collectors from the finest materials and with the highest standards of craftsmanship. The System Kit includes all of the parts and components to properly install a complete solar water heating system: The primary components are the collectors, heat storage, and controls. Optional add-ons allow you to customize this kit for your specific needs. The TSA (Tank System Assembly ) is pre plumbed and wired as a complete assembly. It contains the water heater tank, pump controller, tank sensor, drain valve, system drain valve and the wiring and piping to make all connections. The TSA, the collectors and the interconnect piping make up the complete system. Delivery Information: Solar kits are packaged and shipped to fulfill each customer's specific requirements. Please allow 3 to 14 business days for orders to be processed and the kit to be assembled, plus standard transportation delivery time. Items may be shipped from more than one location and arrive on different days.